A male in his 50s with history of HTN, DM, HLD presented with chest pain of less than one hour duration. There is sinus rhythm. There is fairly high QRS voltage, however the morphology of the QRS is otherwise normal, i.e. there is no LVH morphology (although voltage is high) or other QRS abnormalities that would adjust your expectations for the repolarization findings. There is a small amount of STE in V2 and V3, with a very small amount of STD in V4-V6. The T-waves are not definitively hyperacute. There was no prior for comparison. 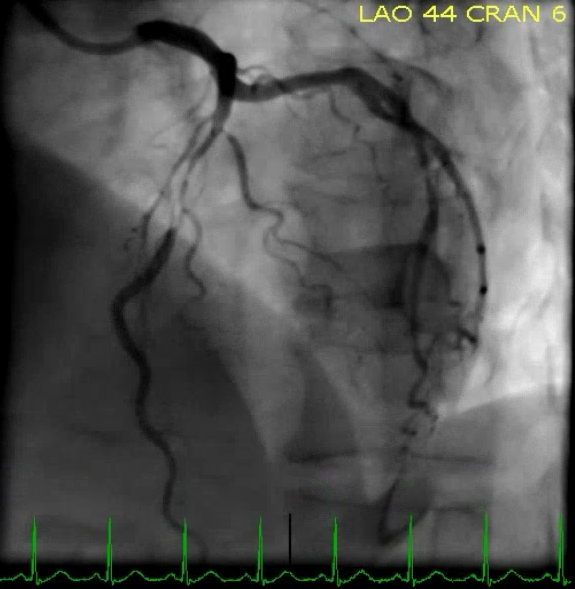 The lateral and inferior leads neither help to confirm or deny the suspicion of LAD occlusion. The subtle LAD occlusion vs. early repol formula is contraindicated because of the very slight ST depression. This ECG was texted to Dr. Smith with no clinical context. He responded: "Very interesting! V4 and V5 ST depression make this very unlikely to be a normal variant." He is implying that LAD occlusion is suspected based on the STE in V2-3 with STD in V5-6. The ECG was interpreted as non-ischemic. The patient was closely monitored. Obviously progressing into a clear STEMI. Meets formal STEMI criteria in V2-V3. Also notice clearly hyperacute T waves in V2-V4, as well as worsening STD in V5-6 and II, III, aVF. Trop T peaked at only 0.91 ng/mL. This is likely due to rapid presentation by the patient and appropriate rapid repeat ECGs with quick intervention. Most sustained LAD occlusions without rapid intervention will generate a troponin higher than this. In our experience (no literature for or against as far as we know) the combination of abnormal STE in the right precordial/anterior leads with STD in lateral leads seems to be indicative of very early or impending LAD occlusion. You will see many patients with chest pain and ST elevation in the anterior leads, however you cannot assume it is normal variant ST elevation when there is STD in the lateral leads, which is essentially never normal in the setting of a normal QRS. Repeat ECGs make difficult decisions easier. Superb case by Dr. Pendell Meyers, which highlights recognition of subtle acute findings. Although I arrived at the same conclusion as Drs. Smith and Meyers in this case — my path for getting there differed slightly … I illustrate the rationale for my approach in Figure-1. Figure-1: The initial ECG in this case. R wave amplitudes in several leads are noted in RED (See text). I was not impressed by the ST-T wave in lead V2. I thought the amount and shape of the ST-T wave in lead V2 was comparable to what may be seen in a normal tracing. There is definite voltage for LVH. A R wave ≥20 mm in any inferior lead (II, III, or aVF) satisfies voltage criteria. In association with overall generous voltage, with definite voltage criteria for LVH satisfied in 2 of the inferior leads — I interpreted the ST segment flattening with slight ST depression in lead V6 + the slight J-point ST depression in lead V5 as a “strain” equivalent. In view of the clinical setting (a 50yo man with diabetes and hypertension) — I thought these findings more than enough to qualify for an ECG determination of LVH. My Initial Impression of ECG #1: I was not at all certain from this initial tracing if the findings in ECG #1 represented an acute event. Without availability of a prior tracing for comparison — I felt there was no way to distinguish the subtle lateral chest lead findings from being a longstanding marker of LVH (as a “strain” equivalent) — vs potential new ischemia. This left me with lead V3 as the single lead of definite concern — and, a single lead is not enough to make a definite diagnosis … BOTTOM LINE: This patient’s age and clinical history (diabetes; new-onset chest pain presenting to an ED) — automatically place him in a high prevalence group for an acute event. Clearly, more information is needed before a definite decision can be reached — but the “onus of proof” is on the clinician to rule out acute LAD occlusion. The 2nd ECG done 45 minutes later removed all doubt! As I discussed in detail in Dr. Smith’s blog post from December 27, 2018 — more than 50 criteria have been proposed in the literature for the ECG diagnosis of LVH. Whenever there are so many potential answers to any clinical question — it means that none of “the answers” are nearly as good as we would like. Even in the best of hands — sensitivity of the ECG for assessing LVH is no more than 60%. The “good news” is that despite this poor sensitivity — when certain criteria are satisfied, specificity for LVH may be excellent (ie, >90-95%). Specificity of the ECG for LVH is greatly enhanced if, in addition to fulfilling one or more voltage criteria: i) the patient is of a certain age (ie, patients under ~35 often manifest larger QRS amplitudes not indicative of true chamber enlargement); ii) the patient has a condition(s) that predisposes to LVH (such as hypertension, as in this case); and, iii) ST-T wave changes consistent with LV “strain” are present in one or more of the lateral leads. NOTE: Even if the classic, slowly downsloping (sagging) ST-T wave depression of LV “strain” is not present — a more subtle picture of lateral lead ST-T wave abnormality (ie, ST flattening and/or slight depression as seen in this case) qualifies as a “strain equivalent”, and serves to enhance specificity for LVH when voltage criteria are met in association with a predisposing condition. The presence of LVH on ECG often makes it much more difficult to assess for acute coronary disease. That said, given the history of new-onset chest pain and the abnormal appearance of the ST-T wave in lead V3 in the initial ECG — one has to be concerned about possible acute LAD occlusion until you prove otherwise. CLICK HERE — for more on My Approach to ECG Assessment of LVH (including the voltage criteria I favor). This ECG comes from Pierre Taboulet (http://www.e-cardiogram.com/)(https://www.facebook.com/ECG.taboulet) an ECG whiz who codes a lot of ECGs for Cardiologs' Artificial Intelligence Deep Neural Network algorithm (https://twitter.com/CardioLogs). Smith SW et al. A Deep Neural Network learning algorithm outperforms a conventional algorithm for emergency department electrocardiogram interpretation. Cardiologs founder, Yann Flereau, was named by MIT as the European Innovator of the Year. Wow. What an honor. 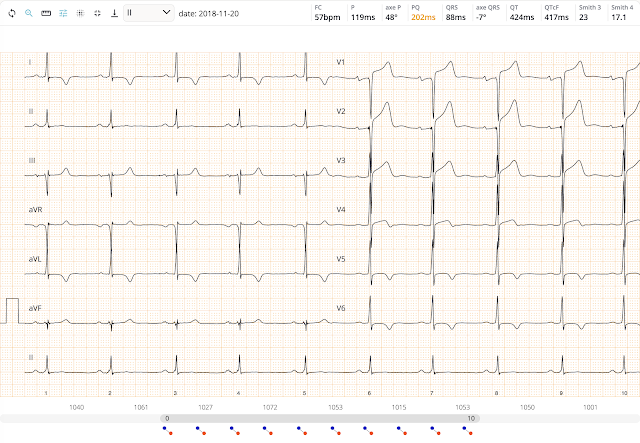 This ECG is displayed on the Cardiologs platform. Clinical History: This patient had no ischemic symptoms, but did have a systolic BP of 220 mmHg. You can see that the platform provides several important numbers, but unlike any other platform that I know of, it also displays the results of the 3- and 4-variable formulas for differentiating early repol from LAD occlusion (upper right corner). The algorithm did not diagnose LVH. My immediate impression of the ECG was LVH. But it does not meet any of the standard criteria. However, it does meet new LVH criteria, which were recently derived and validated: sum of the amplitude of the deepest S wave in any lead plus the S wave in lead V4. If the deepest S wave is in V4, then double that value. If the total is greater than 2.3 mV (23 mm) in women and greater than 2.8 mV (28 mm) in men then left ventricular hypertrophy is diagnosed. Total = 26 (not greater than 28), so not LVH by the new rule! Nevertheless, it has the look of LVH. Peguero JG et al. Electrocardiographic criteria for the diagnosis of left ventricular Hypertrophy. JACC 69(23):1694-1703; April 4, 2017. Still, sensivity was only 62%, with greater than 90% specificity. The formulas were not derived or validated on ECGs showing LVH, and their accuracy in this circumstance is uncertain. I do believe that the 4-variable formula will work very well in LVH. But we need to test it. My subjective interpretation, and that of Pierre's, is of LVH with secondary repolarization abnormalities, including pseudoSTEMI ST elevation in V1-V3. But lead V2 has a worrisome amount of ST elevation, and in a chest pain patient, I would be worried about STEMI. This was the patient's baseline LVH ECG. A warm welcome to our friend and colleague from France = Dr. Pierre Taboulet, who always offers the most challenging of tracings. As per Dr. Smith — I greatly enjoyed working with the Cardiologs’ ECG platform, and found it expeditiously helpful to have Dr. Smith’s formula values already calculated and readily displayed for me at the time I viewed the ECGs I was interpreting. I would add the following comments to the ECG discussed in this case. For clarity — I’ve reproduced this ECG, to which I’ve made a few additions (Figure-1). 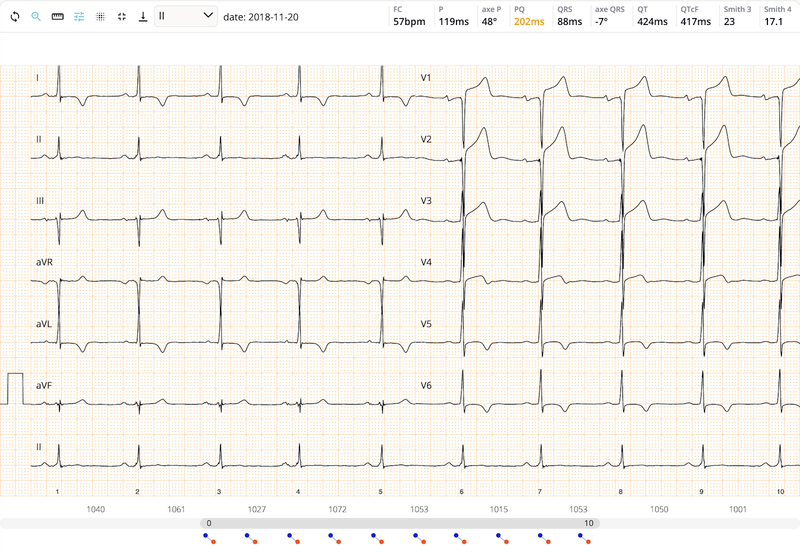 Figure-1: The ECG in this case, with R wave amplitude in lead aVL noted, and showing the mirror-image of the QRS complexes and ST-T waves in leads V1 and V2 (See text). The Clinical History helps in ECG assessment for LVH. It is important to appreciate that even before looking at the ECG itself — the chance of true chamber enlargement is greatly increased IF the patient is older, and has longstanding hypertension and/or underlying heart disease likely to predispose to chamber enlargement (ie, heart failure, cardiomyopathy, valvular disease, etc.). Specificity of the ECG for LVH is greatly enhanced if, in addition to voltage criteria — the patient also manifests ST-T wave repolarization abnormalities consistent with LV “strain”. The physiologic basis for the finding of LVH on ECG, is that with increases in left ventricular mass — electrical forces directed toward the LV (left ventricle) increase, and this produces larger R wave amplitude in one or more left-sided leads (ie, leads I, aVL, V4,5,6). As a corollary — right-sided leads (ie, leads V1,V2) often develop deeper S waves, reflecting increased forces moving away from the RV, and toward the hypertrophied LV. Most ECG criteria for LVH reflect interplay between relative R wave and S wave amplitudes in various leads. Because of the overall poor sensitivity of the ECG for assessment of LVH — voltage criteria for LVH are not always satisfied in patients with clear Echo evidence of chamber enlargement. That said, one may still strongly suspect LVH from assessment of an ECG if: i) the patient is of a certain age (ie, patients under ~35 often manifest larger QRS amplitudes not indicative of true chamber enlargement); ii) the patient has longstanding hypertension and/or other underlying heart disease predisposing to LVH; and, iii) LV “strain” is seen despite the lack of voltage criteria. In such cases — my practice when interpreting ECGs for others has been to write, “Probable LVH” as my assessment. CLICK HERE — for more on My Approach to ECG Assessment of LVH. Standard criteria for the ECG diagnosis of LVH are met in this tracing. Accepted voltage criteria for LVH include an R wave amplitude ≥12 mm in high lateral lead aVL — which is present in this case. NOTE: Although challenging to assess due to lead overlap — the clearly darker density of the overlap area in lead aVL to me suggests the peak of the R wave in lead aVL at the point I indicate by the horizontal RED line in Figure-1. PEARL: I find this voltage criteria of ≥12mm in lead aVL especially helpful when the axis is leftward (I measure a frontal plane axis of -10 degrees for this ECG). As the highest “lateral” lead — aVL sees the vector of LV depolarization almost directly toward it, when the axis is leftward. Lower-lying chest leads may not show increased QRS amplitude in such cases. Another (albeit less-used) standard LVH criterion that may be met in this case — is the Cornell criteria. These criteria state that LVH is present IF the sum of the R in aVL + S in V3 ≥20 mm (for a female patient) or ≥28 mm (for a male). We are not told if this ECG is from a male or a female — but if a female, I count 12 (R in aVL) + 15 (S in V3) = 27 mm. The above said, even if voltage criteria were not met in this case — I strongly suspected LVH as the cause of the profound ST elevation in anterior leads because: i) The history is strongly in favor of LVH (No chest pain; marked hypertension); ii) ST-T wave changes consistent with LV “strain” and/or ischemia are seen in multiple leads; and, iii) The SHAPE of the ST-T wave in leads V1,V2 is much more suggestive of LVH than of acute STEMI. Explanation: Just as some patients with LVH preferentially manifest deep S waves in right-sided leads instead of tall R waves in left-sided leads — ST-T wave changes of LV “strain” may manifest a “mirror-image” (= reciprocal) pattern of LV “strain” in right-sided leads. 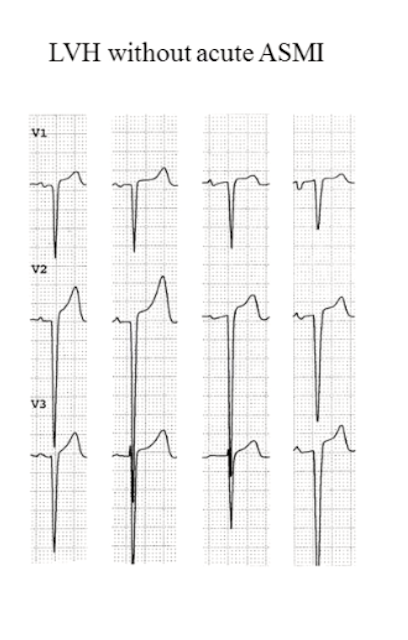 Doesn’t the inversion of leads V1 and V2 shown in the INSERT of Figure-1 manifest an ST-T wave shape that would strongly suggest LVH if present in V5, V6? PEARL: Clinical correlation is KEY in this case. All bets would be off if instead of no chest pain, this patient had worrisome new-onset symptoms. If this was the clinical scenario, then the ST segment coving in multiple leads, with symmetric T wave inversion + 2-4 mm of J-point ST elevation in leads V1-thru-V3 might well represent an acute cardiac event. But in a patient without any such symptoms — marked LVH in a patient with severe longstanding hypertension may sometimes produce very similar ST-T wave changes as are seen in Figure-1. My immediate thought, and the diagnosis I wrote into the formal interpretation was: "Ischemic looking ECG, worry for ACS." Why did I think this? There is an abnormally inverted T-wave in lead III and some ST depression in V3-V6, and a downsloping ST segment in V2. This 40-something woman with no medical history or risk factors presented to triage, where I was working, stating that she was having short episodes of substernal CP with exertion, starting 2 weeks ago. The last episode was shortly prior to arrival and she was asymptomatic on arrival. There had been a total of approximately 6 episodes, never lasting more than 15 minutes. Most recent was shortly prior to arrival. She described mid sternal non radiating pressure-like chest pain associated with dyspnea and diaphoresis. Symptoms resolve fairly quickly with rest. Symptoms have never occurred at rest. Prior these symptoms, she was a fairly active person with good exercise tolerance and no exertional symptoms. The patient had no more chest pain while in the ED. 3 Troponins each 2 hours apart were all below the level of detection. A repeat ECG was done 7 hours later. ECG: most would give it a 1, but if you know ECGs, this one is ischemia until proven otherwise. First, pain which comes and goes and does not last long is frequently too brief to result in a positive troponin. Thus, absence of positive troponin is not particularly reassuring. 2) the troponin is very often negative. Second: The ECG is far from normal and actually looks ischemic. If I were to modify the HEART score, I would give 3 or 4 for the history alone! I would give 2 for the ECG. That would be 5 or 6. With this history and these 2 ECGs, there is no doubt about ACS, in this case "Unstable Angina" because troponins are all negative. The admitting physician was concerned about "Stable Angina." However, since this is new and exacerbated by ever decreasing amounts of activity, this is unstable angina. Instead of an angiogram, they ordered a stress echo was done, starting with a rest echo. 1. Regional wall motion abnormality--basal to mid inferior akinesis at rest, no change with stress. 2. Regional wall motion abnormality--apical septum, mid anteroseptum, and mid to apical anterior hypokinesis with stress. 3. Left ventricular function normal at rest, no change with stress. 4. Ischemic ECG response with adequate heart rate. 5. The patient did report angina with stress. 6. Exercise capacity was poor (40% predicted for age and gender). ACS - Unstable Angina . 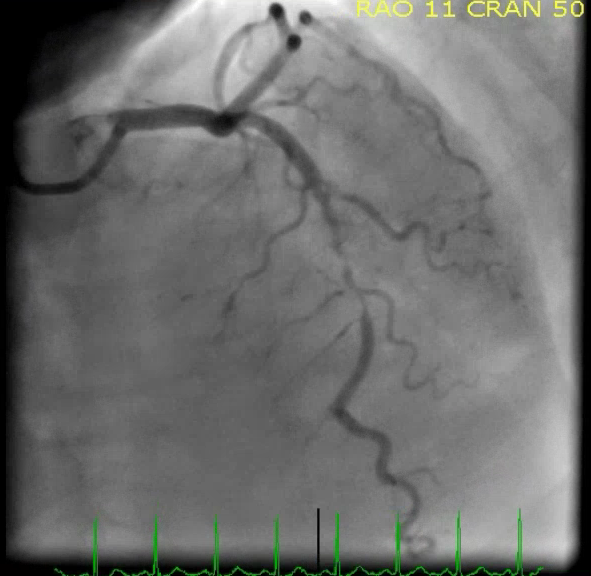 Culprit is 95% stenosis in the distal RCA. 1. The ECG is still essential for diagnosis of ACS. Even with high sensitivity troponins, much ACS is missed if the ECG is ignored. Excellent example by Dr. Smith of a less obvious pattern of ischemia — and of the benefit of serial tracings for confirming the findings on the initial ECG. 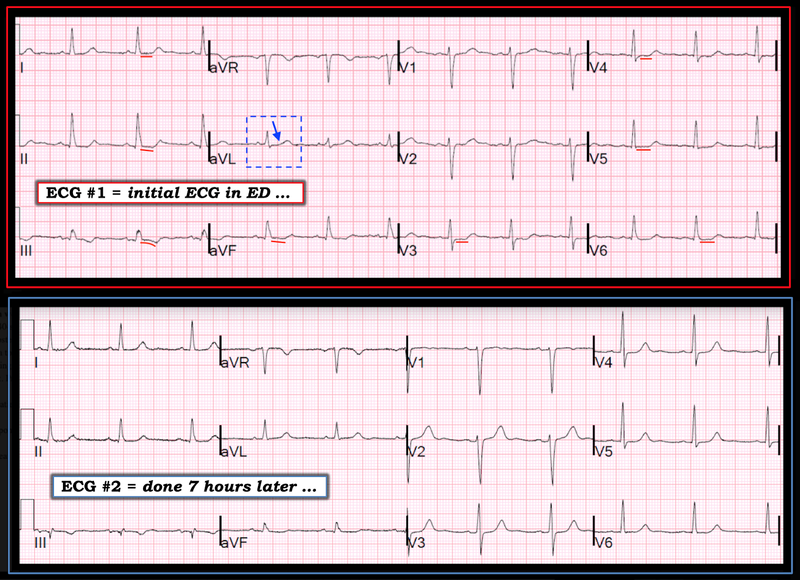 For clarity — I’ve put the first 2 ECGs done on this patient together in Figure-1. 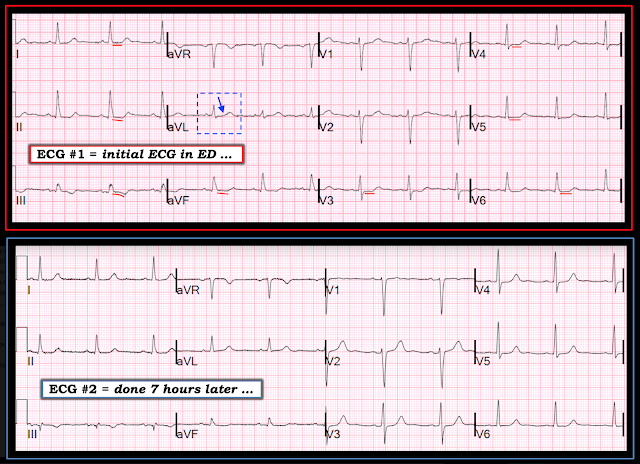 Figure-1: The first 2 ECGs done in this case (See text). Despite the relatively younger age for this female patient (40yo) and the lack of cardiac risk factors — the clinical history is classic for angina pectoris: The patient describes new-onset brief episodes (≤15 minutes) of mid-sternal chest pain precipitated by exercise, and promptly relieved by rest. As per Dr. Smith — not only has this patient told us that she has angina — but she has told us that she has unstable angina because: i) Prior to the past 2 weeks — she was active with good exercise tolerance and no exertional symptoms; and, ii) Her episodes are precipitated by progressively less strenuous exercise. Given this history — the burden of proof is on us to rule out (rather than rule in) significant coronary disease! Slight ST segment depression in several leads. ST segment flattening (straightening) in multiple leads — which I have highlighted by the short, straight RED lines in Figure-1. Isolated shallow T wave inversion in lead III is by itself not necessarily abnormal — but it is abnormal in the context of subtle abnormalities in each of the 3 inferior leads. Thus, there is ST straightening and slight downsloping in leads II and aVF — and some ST coving in lead III that leads into the inverted T wave in this lead. NOTE: By way of comparison — the ST-T wave in lead aVL within the dotted BLUE rectangle is normal. The portion of the ST segment that is straight is much shorter for this complex in aVL — and, transition from the ST segment to the beginning of the T wave is much more gradual with a smooth upsloping (BLUE arrow). It should be obvious that the ST-T waves in all leads with RED lines look very different (with a longer straight ST segment and a more abrupt beginning of the T wave). What do these ECG Findings Mean? I describe the above findings in ECG #1 as, “nonspecific ST-T wave abnormalities”. The reason they are called “nonspecific” — is that numerous conditions (many of which are non-cardiac, such as hyperventilation; temperature extremes; “sick patient”; fear or pain; electrolyte disorders, etc.) may produce similar ECG findings as those seen in ECG #1. 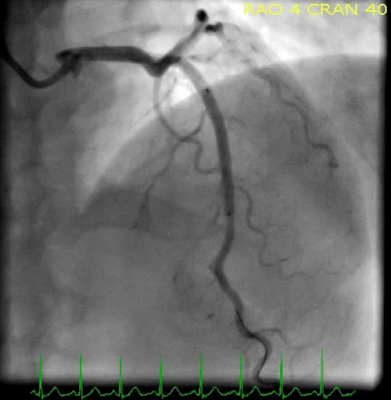 However, in the context of a classic history for angina (as is the case for this patient! ) — these ECG findings should be interpreted as ischemic until proven otherwise! As per Dr. Smith — there is less ST depression in ECG #2 compared to ECG #1. Lead-to-Lead Comparison of ECG #1 and ECG #2 reveals another very important finding. Note that despite no more than minimal change in R wave progression and QRS morphology in the chest leads — T wave amplitude in leads V2-thru-V6 has clearly increased in ECG #2. This confirms that there have been dynamic ST-T wave changes in this 2nd ECG done 7 hours later after complete resolution of chest pain. 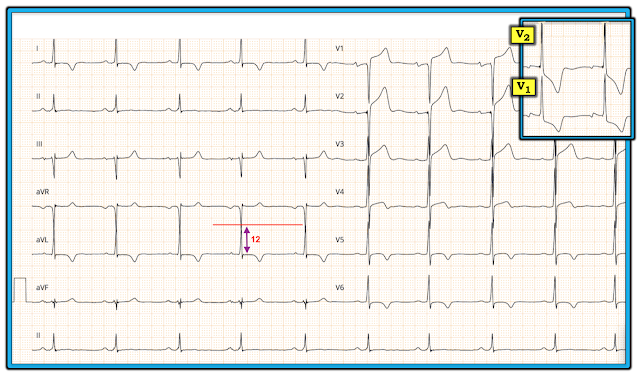 Note that the nonspecific ST-T wave straightening persists in many leads in ECG #2. While true that an abnormal troponin might expedite diagnosis — the fact that serial troponins were all negative in this case is not at all unexpected. This patient has anginal chest pain — but not myocardial infarction. The Stress Echo did not have to be done. Although this test turned out to be markedly abnormal — a definitive diagnosis was already evident (and was already made by Dr. Smith). The fact that this patient provided a classic history for unstable angina + an abnormal initial ECG + dynamic ST-T wave changes on the 2nd ECG after resolution of chest pain — is definitive for a diagnosis of acute coronary disease until proven otherwise by a negative cath. PEARL: If the results of a clinical test you are about to order will not change your management — then you probably do not need to order that test! False negative results can be seen with Stress Echo. Cardiac cath will be needed regardless. I understand that the admitting physician “wanted to be sure” — but the reality is, that all Stress Echo did in this case was to delay coronary catheterization while increasing the cost of care. It is important to get good at recognizing subtle ECG findings such as nonspecific ST-T wave straightening (flattening), as highlighted by the RED lines in ECG #1. Many clinicians (including some cardiologists) call such ST-T waves “normal”. This case illustrates how under the right clinical circumstances, such subtle ECG findings may be diagnostic. With practice — it becomes easy to instantly recognize this nonspecific ST-T wave straightening. You can then correlate this finding to the clinical scenario to determine if there is relevance to the case at hand. 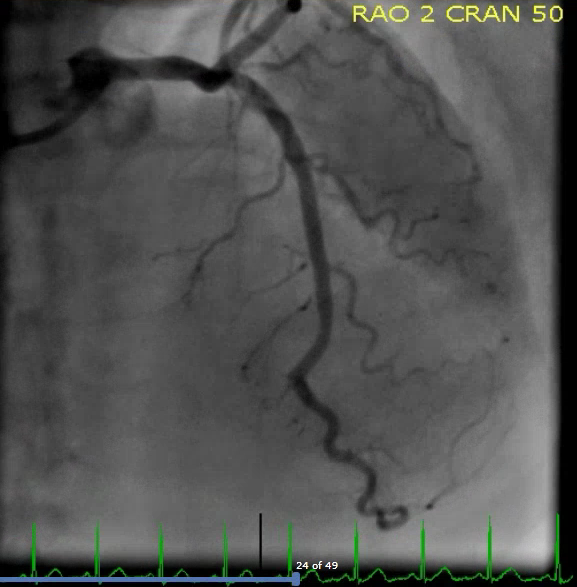 Finally — this case also illustrates how lead-to-lead comparison of serial tracings, correlated to the clinical history can make a definitive diagnosis that may obviate the need for “other tests” prior to cardiac catheterization.